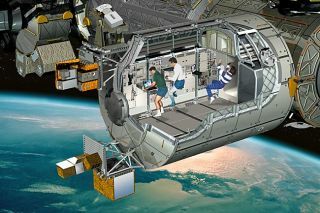 Although Columbus will be the smallest laboratory on board the International Space Station, it offers the same workspace volume as other science modules on orbit. When sevenastronauts rocket into space this week aboard the shuttle Atlantis, they'll ferrya shiny new science laboratory to the International Space Station (ISS). Thezero-gravity European lab known as Columbus, which is about the size of a smallbus at 27,000 pounds (12,250 kilograms), will carry four major experiments. Astronautscientists visiting the module will investigate microgravity's impact onhumans, explore the behavior of weightless fluids and see how materials fare inthe merciless vacuum of space. The polishedcylindrical lab—more than 20 years in the making—will be the European Space Agency's(ESA) first module to be latched onto the space station, complementing U.S. and Russian rooms. "Nowwe bring our own research module," said German astronautHans Schlegel, who will climb into a bulky spacesuit and help permanentlylatch Columbus onto the ISS on Sunday, if all goes as planned. "We willhave the room and capabilities to conduct European science experiments aroundthe clock." Led by commanderStephen Frick and piloted by rookie spaceflyer Alan Poindexter, NASA ismaking Columbus' delivery a primary goal during their anticipated 11-daymission, slatedto launch this Thursday. Although Columbus will have room for 16 half-moon-shaped racks, it will initially carry fiveexperimental racks into space. Four of these will hold high-tech life sciences,medical and physics experiments, while another will serve as storage space. The Biolabexperimental rack will have astronauts peeking at microorganisms, tissuecultures and even small plants and animals. Understanding how plant roots growin space, Laurini said, will be a cornerstone to exploring and inhabiting themoon and distant worlds. "Wehave to think about moving to another planet or for a long exploration flight,"he said. "We will ? probably [not] be able to carry everything we need toeat. The growth of the plants becomes a necessity and knowing how they behavein space is certainly important." Whileastronauts scrutinize living things with Biolab, others will use the FluidScience Laboratory to see how liquids behave in zero-gravity—perhaps bolsteringenergy production both in space and on Earth with their findings. The thirdlaboratory rack, called the European Physiology Module, will be usedinvestigate bone loss, respiration, immune system behavior and circulation inweightless humans in the future. In additionto the internal units, two external units will allow space-faring scientists tosee how living things and manmade materials react to the vacuum of space. Twomore will follow once the tests finish. Overall,Laurini said Columbus' internal environment—a spacious 2,648 cubic feet (75cubic meters)—should provide an ideal environment for doing zero-g science. "It'sa really state-of-the-art facility. We are providing a very good environmentfor the crew," he said. "They will able to do their work in a veryquiet environment. We had very stringent noise requirements [for Columbus]." Noise,however, wasn't the only concern of Columbus' designers—they had to build it tolast roughly 10 years in the harsh space environment. "Theorbital debris environment is getting worse," Laurini said of the millionsof pieces of tiny space junk drifting around the Earth. "We ? asked our contractorto make it tough." Laurini said EADS Astrium Space Transportation, whoconstructed most of the module, met the challenge. Although Columbus is the lightest and smallest science laboratory for the ISS, it offers the sameinternal space due to specially reinforced, 0.16-inch-thick (4-millimeters)protective plates. The lab'sheavy power consumption, about 20 kilowatts during the running of severalexperiments, is significant. That's enough to power to run 200 lightbulbs ratedat 100 watts, or roughly the homes of more than four, five-person households. "It'sa lot of power," he said, explaining that the lab will need the energy torun high-tech devices, such as cryogenically cooled sample chambers andon-orbit centrifuges. The lab andthe knowledge it's expected to bring will represent a stepping stone on "ourdirect way to leaving Earth to maybe inhabit the moon [and] Mars,"Schlegel said. Despite Columbus' historically delayed launch schedule, Laurini said Europe's excitement at theprospect of exploring new scientific realms is palpable. "Wehave gone through very difficult times, but we have overcome themtogether," Laurini said of the 2003 loss of space shuttle Columbia, which ultimately postponed this module's launch. "We are all very excitedfor this."